How it happens and How we can find it ? 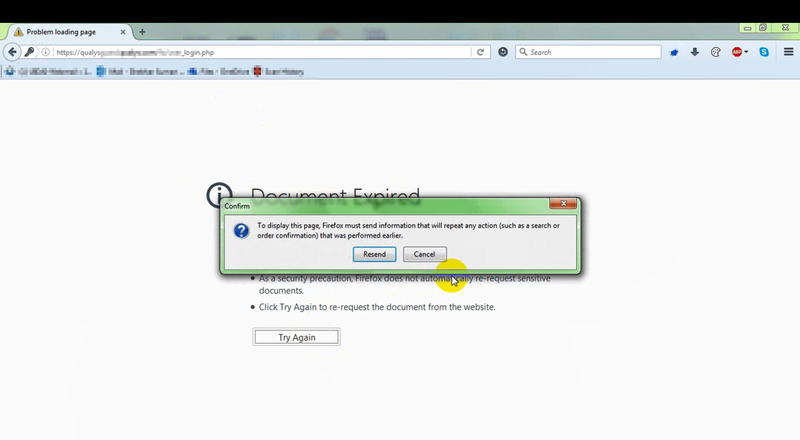 The attacker can use the back button to crawl through the pages the victim has visited lately. Please note he can not make any changes anywhere as it’s not an active session(although, some applications will even allow him to do that.). 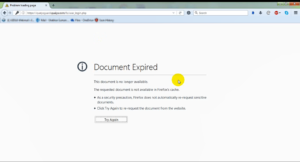 While crawling through if he notices any document expired error page like below, it means there may be some chance to get some information. Now here the attacker will use another browser feature “Refresh”, but before doing that he will configure a HTTP proxy tool like burpsuite, ZAP etc to make sure he captures the request going from the browser to the server. Once he refreshes, the browser will ask the confirmation to resend the information to the server and the information will be captured in the proxy tool. Such kind of bug can be very harmful if it happens after Authentication, registering the user, changing the password, Payment gateways etc. where the user has submitted any sensitive data to the server. As a part of functionality browser instance remembers the pages that it had displayed to the user.It also keeps track of all requests that were sent to the server for fetching a particular page. 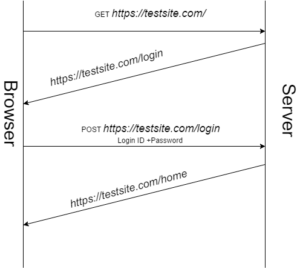 In the above case the “https://testsite.com/home” was displayed only after the user had entered his Credentials(ID+Password). So the browser remembers the request that was sent for fetching the home page. – which contains the “Login ID” and “Password” the user had provided on the login page. 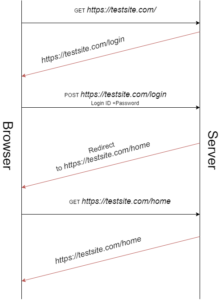 Now when the attacker tries to refresh button on home page, the request that had been used to render the home page is resent to the server. This request contains the credentials which the Attacker will intercept. Below image will describe how an application is programmed insecurely allowing such attack to happen. This is quite simple authentication request flow, so the back button will directly take you to the previous pages(expired one also) without any second level of check. 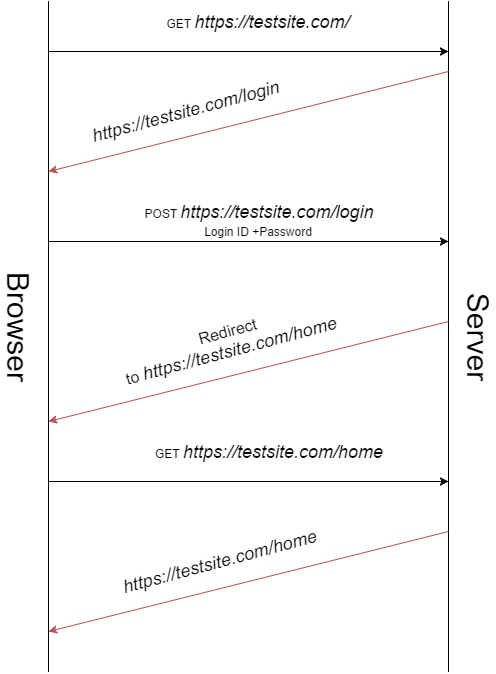 Just assume about a redirect page in between the authentication pages (or any other session changing step, even lets say payment gateways). In this case the user submits the Login ID and password and redirects to another page internally, Here the redirection page doesn’t display on the browser, hence there is no possibility of the attacker to unset he back button to reach the page. Here an important note is that the redirection request must contain the session ID assigned to the user after authentication. I was actually lucky to find this bug in QualysGuard. Being a licensed user for one of their product, It got late while renewing the product. When I tried to log in to the application it presented me the following error. I observed there is no logout button anywhere on the page when I tried to capture this in burp. It made me sure about no redirection after login as well because logically the login was not successful due to my license expiration. Then I thought to play around with back and forward buttons. 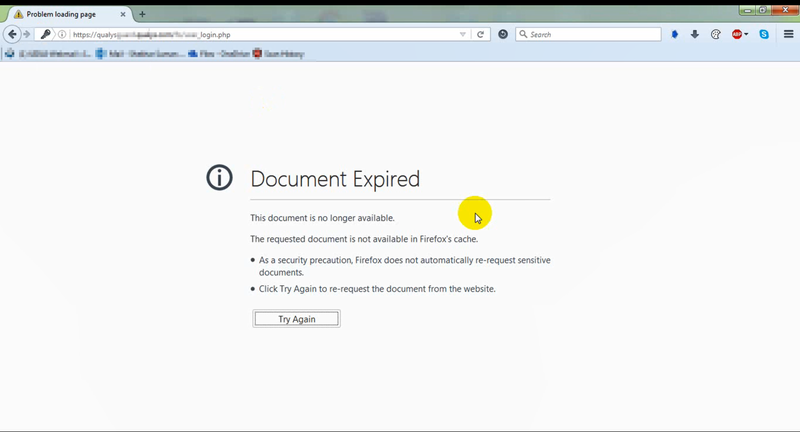 After one back and one forward button it gave me the page expiration page. It confirmed that the browser will try to resubmit some data again. I resubmitted the data again and captured it in burpsuite and Bingo !! it resubmitted my credentials. It took me a while to convince QualysGuard team about this vulnerability. It’s quite clear as this bug requires an attacker to have physical access of the machine. Also at one instance they thought that it’s not a risk as they have implemented HTTPS. I then provided all those write ups I found about this bug over the Internet. Finally they have accepted and implemented the fix. 14/10/2016 :- After continues follow ups, Qualys team finally implemented the fix and asked me for the confirmation. 16/10/2016 :- I confirmed the fix. 23/10/2016 :- Bounty and Swag received. Google lists this on number 5 for search in back refresh attack. 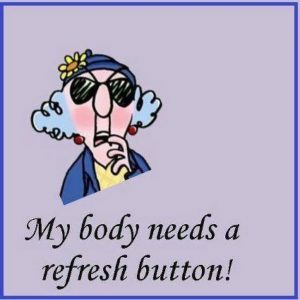 But I think this is the best write up I have read on Back Refresh attack. And congrats for the bounty.